Google have recently been testing new layouts of their main search pages. This looks to be one of the biggest changes they have rolled out this year and it’s right alongside the major sidebar ad changes made in February. This article will cover what they are doing, what benefits could they provide and what marketers should take from this. Over the past few months Google has been under a lot of scrutiny with moving more and more of its layouts to promote their advertising over organic results. 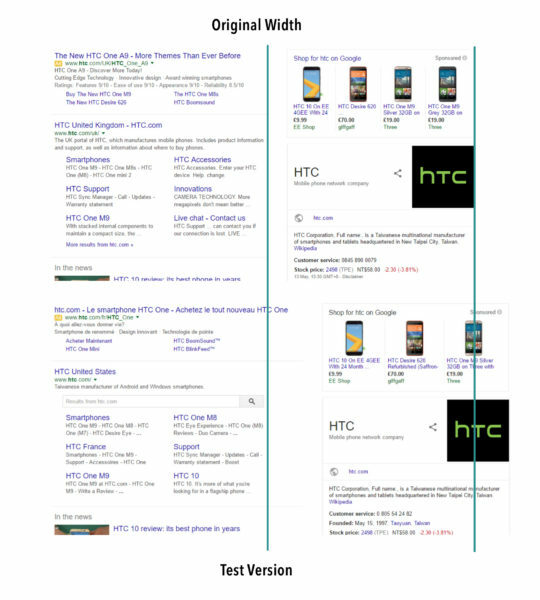 Back in February Google finally rolled out an update to their ads layout that they had been testing since 2010. That update was to eliminate sidebar ads completely and to push an additional 4th ad at the top for some more competitive queries. As an update this was not well received however personally I can understand why they did it. This alone makes desktop and mobile results more consistent and with mobile traffic rapidly increasing over desktop, something needed to be done. 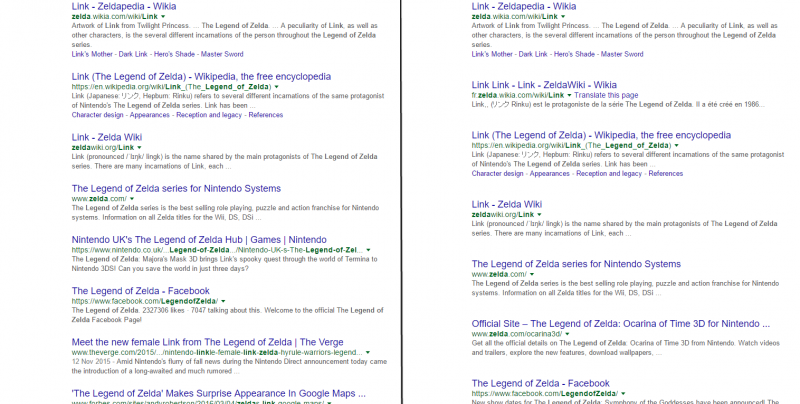 Since then, in early May there have been reports of Google testing another update in the layout of their SERPs. This time they are not altering the number of ads but altering the widths of their main organic results. This was originally noticed by Jennifer Slegg and posted on The SEM Post when the tests first started. Since then I have noticed more and more aggressive tests here in the UK and variations being altered in as little as a few hours between countries. It looks like the dust is starting to settle now, so I am expecting a final live version soon. I will cover what I have noticed and where I think Google are heading with this. The first thing noticed was the revised widths for the search pages themselves. It looks like there has been an increase in the width of main search listing from around 500px to 600px. This is quite a significant margin and you can see the difference in the screenshots below. I have stacked the 2 versions of the listing on top of each other to easily see the difference as well as adding lines to see where the original margins were against the new. This alone suggests it could be a move to get more content on the screen, with this effectively allowing more on a single line there is slightly less room taken up by ads and more taken up by organic listings. Could this be a friendly move from Google around organic visibility? From comparing all aspects of what could be altered it was also noted that the Google Business listings were affected, however this has not altered the height of them whatsoever. From the comparison below you can see these pages do not let any more organic listings in place. This is another pro to the statement that Google is allowing more organic content on screen. One of the comparisons noted was that on some search listings the reduced width of the sidebar meant there was one less product shown on the PLA sidebar panel. This may be part of a different test, or part of the new layouts, but honestly I was surprised they would put this is as part of their testing. You can see the comparisons I found below. To directly contradict the PLA variation found above, another combination found when looking at these tests was that Google is now testing the new widths with an additional product shown on the main PLA panel for certain search terms. This in fairness makes sense as it doesn’t affect or push down organic listings at all. However, I am confused as to why they would not do this for the variations shown above since the new widths they are using would actually allow them to also show four products in the sidebar PLA panel. I also did a test on a search with no additional paid or knowledge graph features to see how they compare and if they do actually increase the amount of listing visible. Looking at the comparison below, the short answer is no. Whilst it does allow more on screen it is very much reliant on how long a pages meta description is as if it is short enough it will reduce it down to less lines. 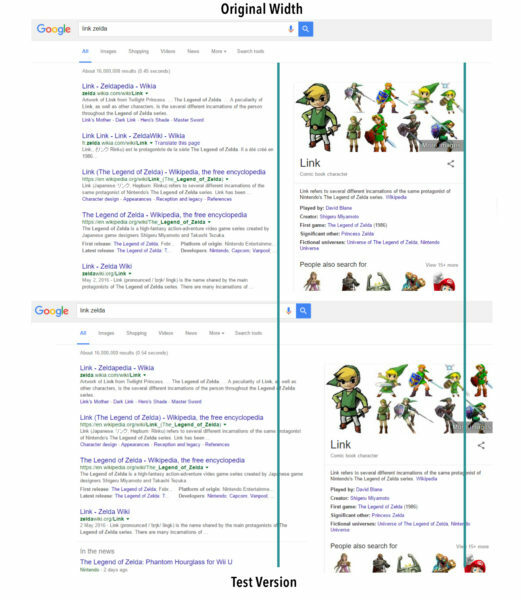 This means Google is now showing more title and meta description detail than ever before. Whilst this is allowing more on screen currently, overtime I would imagine that people will gain this knowledge and adjust their meta details to take advantage of the additional space. Whilst I did most of these tests around the 11th of May, since I have noticed a lot more changes here in the UK. 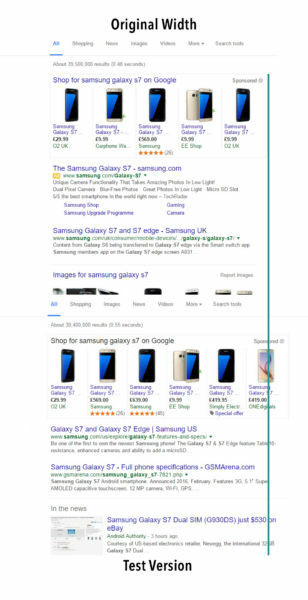 As of the 16th May there have been additional layouts that Google are testing in their serps which to be honest, completely contradicts the thoughts I had of Google trying to allow more organic listings to be visible. You can see now that these are two screenshots of the new width, however they are now testing variations of the height of each listing. This most definitely affects the amount of organic listings on the page and reduces the amount of listing visible on the screen. I would imagine this will be a variation to see what CTRs they get on ads with these layouts. So What Does All this Mean? Is this a Win for Organic Search? 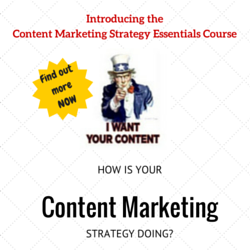 So to answer the common question most marketers jump to. “Is this another step towards showing more ads?” Whilst there are suggestions in this article of the opposite, organic could actually get more visibility from this update. I am now doubting this is Google’s actual intention. This is an update moving to something much bigger. umn interface. With desktop you get the dual column containing the main listings and a sidebar. Combine this with the knowledge that desktop is rapidly declining and as a population we are accessing the information on increasingly more sophisticated mobile devices via the internet of things. Google needs to find a way of providing a singular stream of information that they can deliver to all devices. This is the early steps of moving desktop results to be much more similar to mobile therefore easier to deliver on all devices. We have already seen the text ad layouts mimic mobile, now we are seeing a decline in sidebar content visibility. I would expect that these changes will go fully live once Google are happy with their testing and we can anticipate more changes to create a more unified listing with knowledge graph at the forefront over the next few years. For marketers, this means that we are approaching a world where Google is encountering devices that cannot give the users 10 options to choose from like it has been over the last decade. More people are speaking to their devices and getting singular responses in return. This all moves to a more streamlined way of Google outputting information and also puts pressure on them to make sure they can still monetise the information they offer. Expect to put much more time and effort into content that can be read by Google for use into their knowledge graph and expect more ads and parts of the knowledge graph to appear in the main search results. I do not think we are far away from seeing the branded banner ads discussed here in 2014 to help monetise the main search area. Is this a win for organic search? It’s looking unlikely at this stage. If anything this is a move to get more content including ads into the main search area. Are these New Versions Live? As of the 24th May I can no longer get the original widths for any test I try. For me this looks to be live however John Mueller in this Tweet has stated they are still experimenting. Personally I found the images by alternating between google.co.uk and google.fr to get the changes. If anyone else is still seeing the old widths, please tweet me or comment below and I will continue monitoring. From the looks of it, although unconfirmed, these new variations could be live. 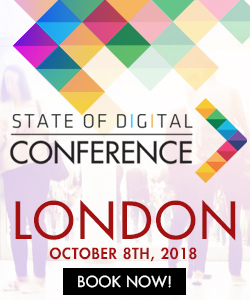 Adam Mason is a technical SEO specialist and co-founder of Datify, a data driven digital marketing agency in the UK.